Independent coffee shop The Interesting Eating Company has launched a further two Ultimate Cafe outlets in partnership with Ultimate Outdoors. 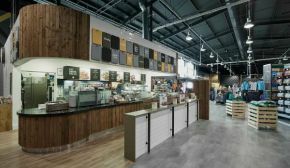 As part of the long-term affiliation between the local eatery and the outdoor retail giant owned by JD Sports Fashion plc, the brand provides in-house coffee shops in the new Dudley and Nottingham Ultimate Outdoors. Similar to the original Preston-based site, Ultimate Cafe is homed on the ground floor of both venues located within Merry Hill (Dudley) and Castle Marina Retail Park (Nottingham), and mirrors The Interesting Eating Company’s ‘great food and service’ ethos. Director of The Interesting Eating Company Nichola Lee said: “Having approached and successfully struck a partnership with the sports fashion and outdoor group, and now to have established three Ultimate Cafes spanning across the UK, it gives us a great sense of pride and achievement to see how the brand has developed. Since setting up The Interesting Eating Company back in 2012, we have been keen to extend our offerings and maximise our customer reach. Ultimate Cafe located within Ultimate Outdoors echoes The Interesting Eating Company’s signature branding and quirky offerings, which include specialty pancakes and waffles, ‘grab and go’ light bites, cakes and freshly prepared gluten free variations, as well as barista hot beverages. To keep children entertained, the new sites also feature large scale state-of-the-art indoor soft play areas, which enable youngsters to exercise while having fun. Fellow Director of The Interesting Eating Company Andrea Edwards said: “Having opened the original Preston-based Ultimate Cafe almost one year ago, it’s fantastic to see how far we have come in a relatively short space of time. We hope that the new Dudley and Nottingham outlets will receive a great response from the public, while developing our prominence further afield. Ultimate Cafe has provided 40 new jobs across the three sites, whereby staff members have undergone various training and development schemes.